A groundbreaking portrait of Kerouac as a young artist from the award-winning author of "Minor Characters"
In "The Voice is All," Joyce Johnson, author of her classic memoir, "Door Wide Open," about her relationship with Jack Kerouac, brilliantly peels away layers of the Kerouac legend to show how, caught between two cultures and two languages, he forged a voice to contain his dualities. Looking more deeply than previous biographers into how Kerouac's French Canadian background enriched his prose and gave him a unique outsider's vision of America, she tracks his development from boyhood through the phenomenal breakthroughs of 1951 that resulted in the composition of "On the Road," followed by "Visions of Cody." 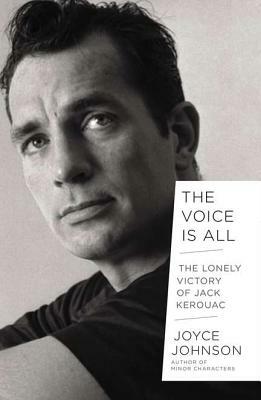 By illuminating Kerouac's early choice to sacrifice everything to his work, "The Voice Is All" deals with him on his own terms and puts the tragic contradictions of his nature and his complex relationships into perspective. Joyce Johnson s books include the National Book Critics Circle Award winner "Minor Characters, Missing Men, Door Wide Open: A Beat Love Affair in Letters, 1957 1958" (with Jack Kerouac), and "In the Night Cafe." She has written for "Vanity Fair "and "The New Yorker "and lives in New York City."